Located in Swindon, in the heart of Wiltshire, but covering the entire South West and nationwide if needed. Neil Tinson owner of A1 Photogenics (founded in 2003 but with over 20 years experience in the industry) offers Professional Photographry services covering Weddings, Portraits School Photography and any other photographic needs. I am a full time professional photographer whose style concentrates on good quality images, and personal service. Every wedding or job is fully researched and approached with the aim of providing the best end product and the highest quality customer service. This was highlighted when i won the Wiltshire Guardian award for leading the way in the photography industry for customer service and satisfaction in 2009. I love being a wedding photographer and I am especially pleased to see the look on the clients face when they see the finished product. 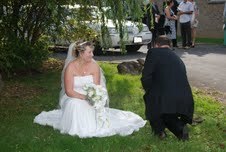 I always ensure the photography runs smoothly and effectively and does not take over your day. From client feedback you can see A1 Photogenics offer quality, affordability, experience, skill and professionalism just a few words that are used to describe my work. I use the latest digital technology so I am not restricted to the amount of photographs taken, giving better coverage of your day. I also offer your images in colour, black & white or other toned styles. I would love the opportunity to show you what A1 Photogenics can offer you. I base my whole business strategy around offering great quality products and customer service at an affordable price. If you have a specific photographic requirement please call or e-mail me for a free no obligation consultation.